High waisted jeans are a big hit at the moment! They are seen everywhere right now, and if you haven’t already jumped on the band wagon, then here is a fantastic way of doing so! These retro inspired designs are a classic meets modern pair; a high waisted cut that will really show off your shape and hold you in, and this trendy metallic finish that almost looks like the wet look leggings from a distance! This slim fit design is understated and easy to wear, they are great for elongating those legs offering a slimmer appearance, and this fabulous pair will team with anything! This design features front zip fly fastening with button detailing and pockets to the front and rear which is great as rear pockets are always incredibly flattering! Team with a tucked in tee and boots for casual wear, otherwise pop on a chiffon blouse and peep toes for evening glam! 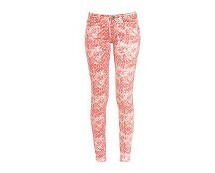 Coloured skinny jeans are summer's must have for legs. Get yours now. Crushed effect colour denim. Soft feel. Skinny fit. Belt included.